Craft’s Winter Orchard on Friday. Another great week of drinking, from making my own Southside at the Plymouth and Beefeater Ginvasion to checking out the guy who took over Matthew Biancaniello’s post at the Hollywood Roosevelt’s Library Bar to a Balvenie tasting with malt master David Stewart. Sadie’s Last Word on Sunday am. Well really, a continuation of my Saturday dive bar hop. After going from Hollywood dive bar to Hollywood dive bar I was jonesin’ for a well-crafted cocktail so finished the night up at Sadie. The front gate was closed but my instincts told me to swing round the side to see if THAT entrance was open. Sure enough it was and there was bartender Giovanni Martinez behind the stick in the center bar. He made me one of his cocktails off the new seasonal menu, The Last Word. Not new to the world, this classic cocktail was created at the Detroit Athletic Club in the ’20s. 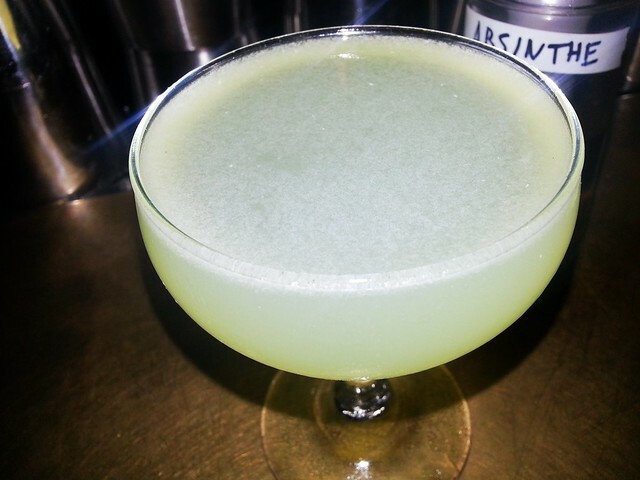 With its mix of green chartreuse, maraschino and gin, it was a welcome departure from the dive bar drinks of the evening. Picca’s Pedro Serrano on Monday. Date night with the bf and I wanted to take him to Picca since he had never been before. Since we arrived 15 minutes earlier than our reservation, we sidled up to the bar for some pre-dinner drinks. Naturally we ended up just taking seats at the bar and dining there, making it really conducive to drinking through the meal while chatting up the bartender. Started with Pedro Serrano, a very spicy cocktail with Single Village mezcal, tequila, lime, green chartreuse, agave and green chile tincture. Plowed through a Cold War Kid made with Acholado pisco, fino sherry, 10-year cognac, lime juice, Vietnamese cinnamon syrup, Angostura and followed that up with a clean-tasting off-the-menu pisco martini. Love the straightforwardness of it with the peach note coming through. Big drinking day starting with a Balvenie lunch and tasting at Chateau Marmont to honor malt master David Stewart’s 50 years with the distillery, the longest such anniversary in the scotch industry, as well as taste the new Balvenie 17 Double Wood which launched this past September to commemorate Stewart’s impressive achievement. 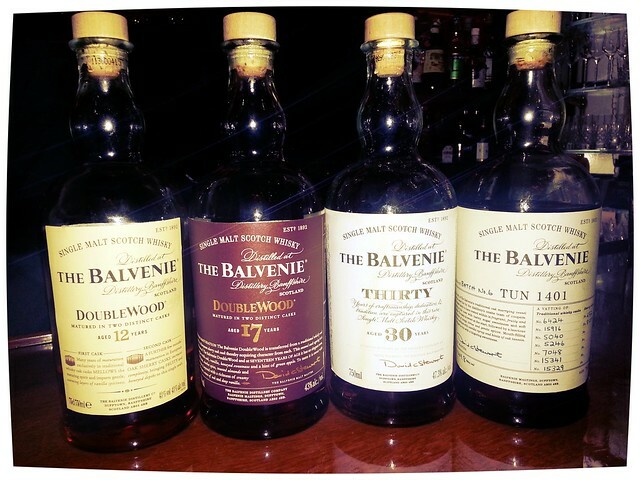 We also sipped on Balvenie Tun 1401 Batch #6 and Balvenie 30 in the lobby. For the Tun 1401, David married nine different casks in the tun, a 2,000-liter marrying cask, with a hand pump…while wearing a suit of course. The whiskey stays there for three months before it’s bottled. The result is rich, complex and honeyed. The 30 year smelled like age while its taste possessed just enough of the sherry cask to give it added complexity. David said that his goal is to always keep the house character present in the scotch or else it stops being single malt. It tasted rich, smooth, sweet and vanilla-y. Southside cocktail at Ginvasion later that Tuesday. Later that night it was gin’s turn. In a downtown art gallery, I joined other gin lovers for Plymouth and Beefeater’s English Ginvasion event. Pernod Ricard’s East Coast gin ambassador Nick Van Tiel schooled us on its distillation process and history. He also took us through the variety of botanicals in gin and guided us through a blind tasting of six popular gins where we could taste how the botanicals manifest differently in each brand. We finished off the evening making our own Southside cocktail with Plymouth gin, mint, simple syrup and lime juice. So refreshing. I hadn’t been to Hollywood Roosevelt’s Library Bar ever since bartender extraordinaire Matthew Biancaniello’s departure but wanted to see how the “new” guy, Chris Hewes, who took his place was fairing. Like Matt he won’t have a physical cocktail menu but will create drinks on the spot based on his customers’ tastes. But he had a few winter cocktails up his sleeve which I was able to try. My favorite of the bunch though was his variation of the Manhattan that he calls The Byrrhman. It’s made with rye, Scrappy’s bitters and byrrh, a red-wine-based quinquina. Craft’s Barrel-Aged Negroni on Friday. Ever since my first visit to Craft in Century City, I’ve been dying to return. So that I did. And, boy, was I glad I did. There, I had the only barrel-aged cocktail I’ve ever really liked. (Note: I never got to try Jeffrey Morgenthaler’s barrel-aged cocktails that time I was in Portland.) It was from beverage director John Dal Canton’s secret stash. He aged a Negroni in a Hudson Manhattan Rye barrel for a year. Now my beef with barrel-aged cocktails is that the aging tends to take my favorite part of a cocktail, the bite, out of it. So I was skeptical about this one. Fortunately, the Campari’s bitterness survived the process and the sweetness was syrupy but not cloying and it worked here thanks to the Campari. John twisted an orange peel over the glass and wiped the rim with it. Simply delicious. Too bad it’s not readily available. 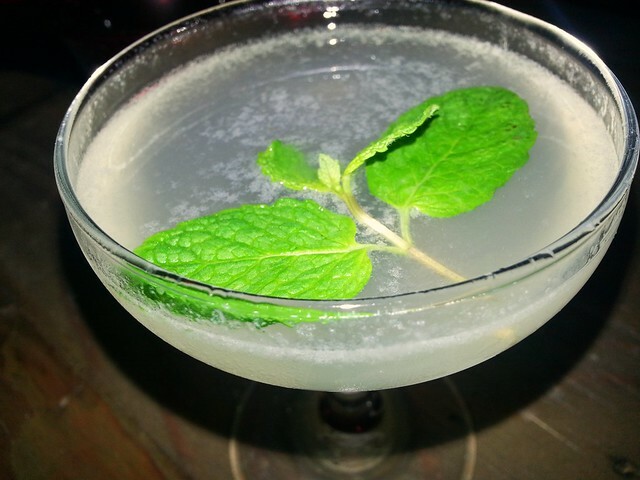 What will be readily available is his Winter Orchard cocktail on the new menu which debuts today. Made with armagnac, Grand Marnier and pear poaching liquid with rosemary rubbed on the glass’ rim, it was the perfect holiday cocktail evoking a cozy night in by the fireplace with the scent of rosemary and pears filling the air. Bonus was that the cocktail was garnished with the succulent poached pear which floated on the ice cube. Afterward since I was heading home I stopped by Sotto. The restaurant and bar were packed but I wanted my nightcap dammit. So I ordered up an Aviation. Bartender Nick Meyers made it dry rather than sweet per my request. Nice, clean and refreshing. For a second nightcap, the bourbon milk punch, which showed up in a previous “Everything I Drank” list, served as my warm milk before bedtime.